Before I started writing this blog or publishing, I did a fair amount of writing for myself and the people with whom I gamed. I recently came across some files I'd stashed away, including the "original" NOD RPG, which was really just a mash-up of Swords & Wizardry and Castles & Crusades, with art from Wayne Reynolds, and this little ditty about racial archetypes. The idea was to swap out the common fantasy races for these archetypes, with options chosen by the players so that they could, in essence, build their own "race" for their character. I used some of these idea later in Space Princess for those races, and a few ideas have probably filtered into Blood & Treasure, but I thought people might enjoy seeing the original, with only a little editing for spelling. Again - assume these were for some unholy mash-up of S&W, C&C and 3rd edition. These rules are designed to let you model races not found in the Player’s Handbook. All of the archetypes in this document except Aliens, Dynamics, and Natives are allowed one attribute modifier from the following list. • +1 Cha, -1 Wis.
• +1 Dex, -1 Con. • +1 Int, -1 Str. • +1 Str, -1 Int and -1 penalty to one ability score of your choice. • +1 Con, -1 Dex. • +1 Wis, -1 Cha. Dynamics are the most common form of adventurer. They rely on training and luck to win the day, not innate powers. Prime Attributes: Dynamic characters may choose three prime attributes instead of the usual two. Aliens are defined by strange physical and mental powers. They are probably the most versatile type of hero, after the dynamic. Virtually any kind of “super powered” hero can be realized with the alien type. Senses: Normal – but see below. Powers: Aliens can choose three powers from the following list. All mental powers that are derived from Jason Vey’s psionics rules follow those rules normally. The alien should be treated as a 1st level psionicist for the purpose of using the ability. If an alien takes a psionic mental power multiple times, he increases his effective level for using that power by 1. Thus, an alien that took metabolic control three times would use the power as a 3rd level psionicist. Alien Mind: Creatures that try to read or control your mind must make an Intelligence save or be confused for 1 round. Dual-Mind: You are capable of engaging in two mental tasks at once, making an attribute check for each at -2. You cannot cast two spells or use to psionic powers simultaneously with this power. In addition, you also get to make two saving throws against mental effects. As long as one mind makes it save, you can ignore the effect, though you suffer a -2 penalty to all actions. Heightened Mentality: Increase one of your mental attributes (Int, Wis, or Cha) by +1. This can be taken more than once, but no attribute can be increased beyond a score of 20. Metabolic Control: See psionics rules. Psionically Gifted: You gain a +1 bonus to all psionic power checks. Psychic Defense: See psionics rules. Spell Resistance: You gain spell resistance 1. Each additional time you take this ability you increase your spell resistance by +1. Telepathic Communication (Wisdom): See psionics rules. Chameleon: This is the ability to change the body’s colors (though not the color of items worn or carried) to match the environment. Generally it should give a bonus of +1 to +5 on hide checks. Energy Resistance: You gain resistance to one energy type (acid, cold, electricity, fire, or sonic). This can be power can taken more than once, but it applies to a different energy form each time you take it. 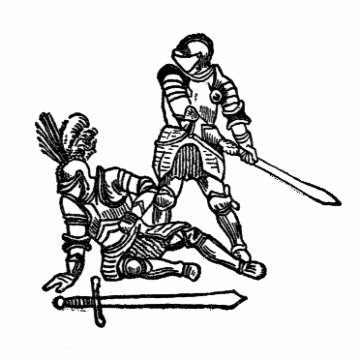 Extra Arms: When using two-weapon fighting, you may make two off-hand attacks instead of one. Alternatively, you may wield an additional shield in combat. Extra Legs: You are a quadruped – you gain a +4 bonus to avoid being knocked over. In addition, your carrying capacity is increased by 10%. Heightened Physique: Increase one of your physical attributes (Str, Con, or Dex) by +1. This can be taken more than once, but no attribute can be increased beyond a score of 20. Heightened Senses: You gain twilight vision, an enhanced sense of smell, and a +2 bonus to all listen checks. Improved Speed: Your base land movement is increased by +5 ft. This can be taken more than once, and its benefits stack. Natural Armor: You have scales, thick fur, or thick skin of some kind that give you a natural AC 12. Each additional time that you take this power you increase your natural armor by +2. Natural Weapons: You either gain a bite, claw, gore, slam, slap, sting, talon, or tentacle attack that deals 1d4 damage. This attack can be used in addition to weapon attacks at no penalty. Each additional time you take this power you can either gain an additional attack form, or increase the damage of an existing attack form by one dice size. 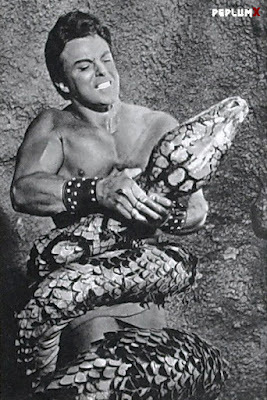 Poison: You are poisonous – either through bite, skin contact, or writhing snakes on your head. Opponents who are stricken must succeed at a Constitution save or suffer 1d6 points of damage. Quills/Spikes: Your outer arms, back, head, legs, etc are covered in quills or spikes. You gain a +1 bonus to AC, and can inflict 1d4 points of bonus damage when grappling or grappled. Opponents that strike you without using weapons suffer this damage automatically. Regeneration: Gains fast healing 1. Spider Climb: You can use spider climb, as the spell, at will. Stretch: You can increase your reach by 5 ft (at the cost of 2 points of strength), and squeeze into small spaces with a dexterity check. Tentacles: Tentacles emerge from some portion of your body – they may replace your arms or legs, or jut out from your chin. They grant you a slam attack that deals 1d4 damage, and grant you a +2 bonus to grappling attacks and climbing. The githyanki are descended from human slaves kept by the mind flayers. Ages ago they rebelled and escaped to the Astral Plane, where they now dwell. Githyankis have three mental powers: Alien mind, heightened mentality (+1 Int), and psionically gifted. 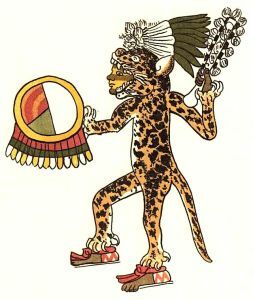 A concept drawn from folklore, beastes are shape shifting magical animals. Senses: Twilight vision, enhanced sense of smell. Alternate Form: Beastes can alternate their form between that of an animal, a humanoid, and a hybrid form. Changing form requires one complete round during which the character can do nothing else. Armor and equipment do not change form along with the beaste. In each form the character’s level and attribute scores are unchanged. Animal Form: When in animal form the beaste is virtually undetectable from a normal animal. Beastes gain the ability to speak with normal animals when in their animal form. While in animal form, a beaste cannot use any weapons, armor, or equipment, nor can they cast spells. They can understand any language they know, but may not be able to reply. Humanoid Form: When in humanoid form, beastes looks like a normal humanoid of a type chosen during character creation (i.e. elf, dwarf, human, orc, etc). Whatever their chosen humanoid guise, they always retain some distinctive feature of their beaste form. The choice is up to the player. 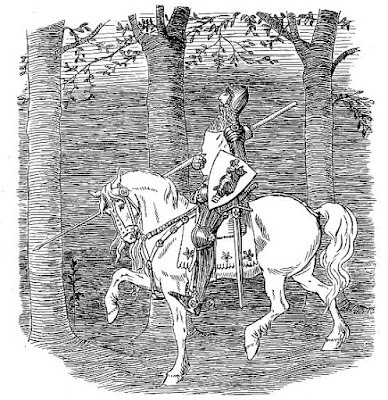 In humanoid form, the beaste loses its twilight vision and enhanced sense of smell. Hybrid Form: A beaste in hybrid form appears as a combination of animal and humanoid – their exact appearance is up to the player. In this form, they retain the special attacks and qualities of their animal form, but also have working humanoid hands, and can speak humanoid languages. Speak To Animals: In all forms, a beaste can speak to animals at will. 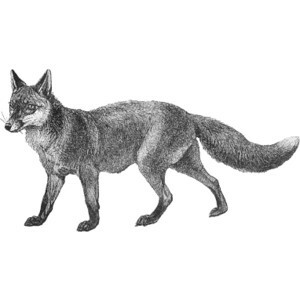 Kitsune are fox beastes of Japanese folklore. They are capable of taking the form of a human, fox, or human-fox hybrid. They gain a +1 bonus to charisma and a -1 penalty to wisdom. Elementals carry the blood of elementals in their veins. All elementals show this heritage in their physical appearance. Elemental Power: Elementals have special abilities based on their elemental heritage. Air: Reduce falling damage by 50%, double jump distance. Fire: Deal 1 point of fire damage with all melee attacks. Water: Breathe underwater, gain swim speed equal to land speed. The fire gnomes are gnomes that dwell near volcanoes. They have 50% resistance to fire and can deal 1 extra point of damage with their melee attacks. In addition, they have the small subtype, giving them a +2 bonus to dexterity and a -2 penalty to strength. They have a +1 bonus to intelligence and a -1 penalty to strength (making a total -3 penalty to strength). Macabres are either born from the undead (i.e. their parents were made undead while they were in the womb, or they were sired by a vampire, or there was a strange ritual involved), the result of botched resurrections on their pregnant mothers, or maybe they are actually sentient undead. Macabres can choose to be intangibles (like ghosts, shadows, or wraiths) or corporeals (like zombies, ghouls or vampires). They can be small, medium, or large. Resistance: Macabres are damaged by positive energy and healed by negative energy. Thus cure light wounds will inflict 1d8 points of damage on a macabre, while inflict light wounds will cure 1d8 points of damage. Stunning Touch: Macabres have a touch attack that stuns living creatures for 1d4 rounds if they fail a constitution saving throw. They can use this once per day. Intangibles: Intangible macabres can use ethereal jaunt once per day. Corporeals: Corporeal macabres have a 50% chance to ignore extra damage from sneak attacks, back attacks, and critical hits. The true ghouls are a race of undead that haunts the deepest reaches of the Underworld. Unlike normal ghouls ,they are intelligent and more-or-less civilized. A true ghoul has the normal resistance to positive and negative energy and stunning touch of a macabre. As corporeal macabres, they have a 50% chance to ignore extra damage from sneak attacks, back attacks, and critical hits. They have a +1 bonus to constitution and a -1 penalty to dexterity. Magical characters have magical power flowing through their veins. This is usually due to a fey, planar, or draconic heritage. Resistance: Magicals can choose to have 25% resistance to any three energy types of their choice, 90% resistance to sleep and charm effects, or a flat magic resistance of 10%. Spells: Magicals can choose four 0-level spells, two 1st level spells, or one 2nd level spell to cast as spell-like abilities once per day. The magical character has a caster level of 1 with his spell-like abilities. The list a magical character chooses his spell-like abilities from often corresponds to his heritage: wizard for draconics, illusionist or druid for feys, and cleric for planars. The spells chosen must be approved by the CK. Tieflings have fiendish blood in their veins. They have 25% resistance to cold, fire and poison damage, and can cast darkness once per day. They have a +1 bonus to dexterity and a -1 penalty to constitution. The native is tied to where he has grown to adulthood, whether he is a barbarian of the forests or a city slicker. Native Environment: Natives must designate one “environment” as their native environment. A native can choose from the following environments: Aquatic, Arctic, Desert, Forest, Jungle, Hills, Marsh, Mountains, Plains, Underground, and Urban. Man-made dungeons do not count as an urban or underground environment. All natives receive a +1 bonus to initiative, attribute checks that would benefit from familiarity with an area, and +10 ft to movement when in their native environment. 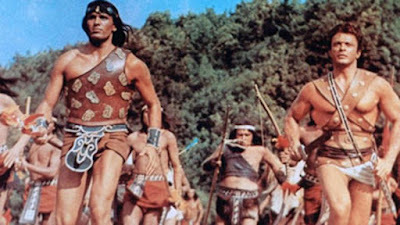 In addition, natives can choose to get either a +1 bonus to hit three traditional enemies of their people (chosen with CK’s approval), or a +1 bonus to hit with a traditional weapon of their people. Finally, natives get a +2 bonus to AC when fighting large creatures native to their native environment. The Cimmerians of Robert E. Howard’s Hyborian tales are native to a land of steep, rugged hills. In such environments they gain a +1 bonus to initiative and attribute checks, a +10’ to their movement. 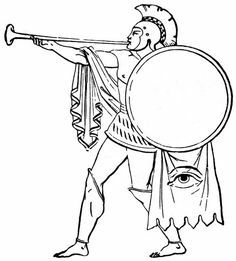 Their traditional enemies are the Picts, Vanir, and Hyperboreans, against whom they are +1 to hit. Against large creatures native to Cimmeria they have a +2 bonus to AC. Prometheans are creatures that are manufactured by other creatures. They are sentient, and as capable of emotion as their player wishes them to be. Prometheans can be built from a variety of materials, including wood, metal, stone, clay, porcelain, or even unliving flesh. Constructed: Prometheans are immune to any effect that requires a constitution save that doesn’t normally affect objects. They do not need to eat, sleep, or breath, although they can benefit from imbibing a magical potion. Outer Shell: Prometheans gains special abilities based on the composition of their outer shell. Choose one. Innards: Prometheans gain special abilities based on their innards. Choose one. In real life, karakuri are primitive Japanese clockwork automatons. In a fantasy game they can be prometheans of ceramic composition and clockwork innards. This gives them a +2 to charisma checks, a +2 bonus to grapple attacks, and a +2 bonus to AC vs. disarming attacks. Since they are constructs, they need not eat, sleep, or breath. They have a +1 bonus to dexterity and a -1 penalty to constitution. The following subtypes can be added to any racial type. Aquatic: Aquatic creatures can breath underwater and gain a swim speed equal to their land speed. They must immerse their bodies in water at least once per day or lose 1 point of Constitution to dehydration. Avian: Avian creatures have working wings; they gain a fly speed equal to their land speed, but suffer a -2 penalty to Constitution due to their hollow bones. Insectoid: An insectoid’s antenna give it the ability to fight without the benefit of sight. They suffer half the normal penalty when fighting blind. Subterranean: Subterranean creatures have darkvision to 60 feet, but are -1 to hit in bright light. Alternatively, they can have deepvision to 120 feet, but suffer a -3 penalty to hit in bright light. Size: A creature’s size is assumed to be Medium, i.e. between 5 and 7 feet in height. Optionally, it can be Tiny, Small, or Large. Happy Easter boys and girls. I hope you have a good one - family, friends, fun and a little time for relaxation and meditation. Hopefully, you also have some time to read this review of Dragon 46 (and White Dwarf 23). I'll level with you here. The first time I saw this cover, I didn't quite know what to make of it. 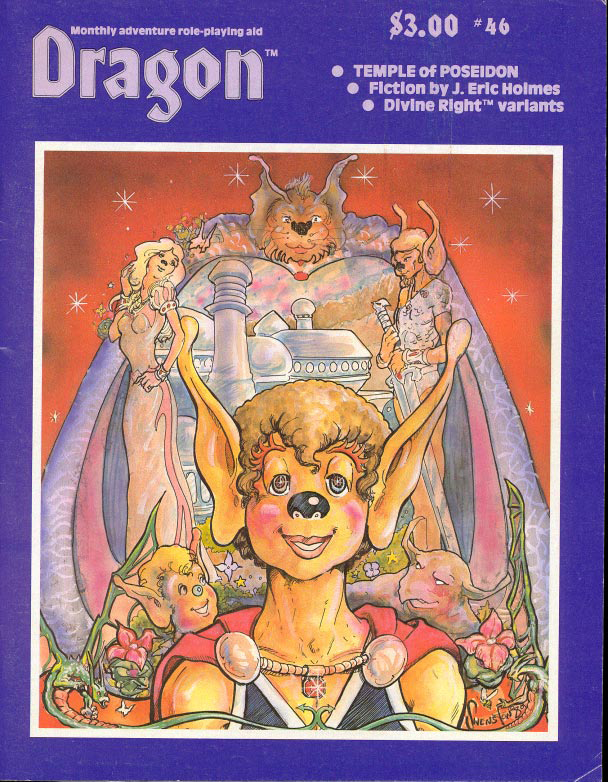 There are a few other "cute" Dragon covers, but this one sorta took the cake. 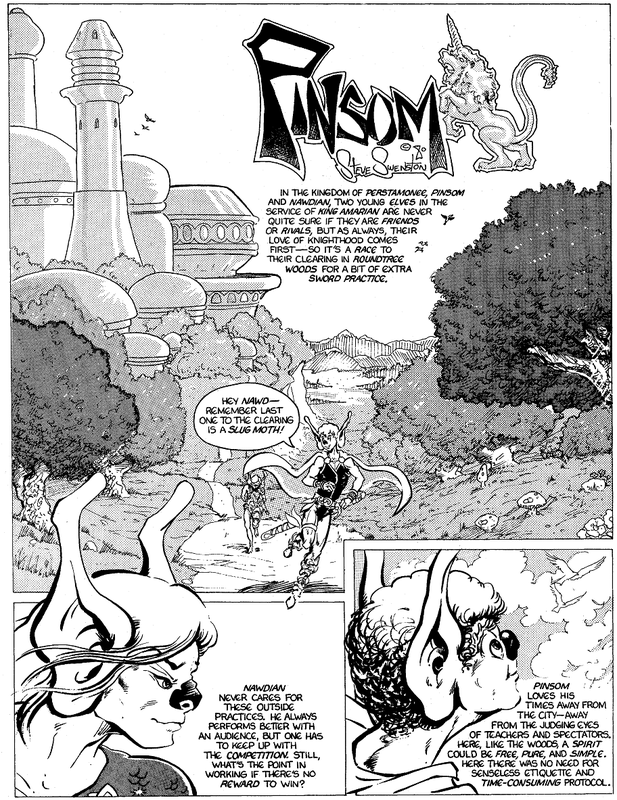 It's not a bad cover, though, and actually relates to a new comic in this issue - Pinsom by Steve Swenston. 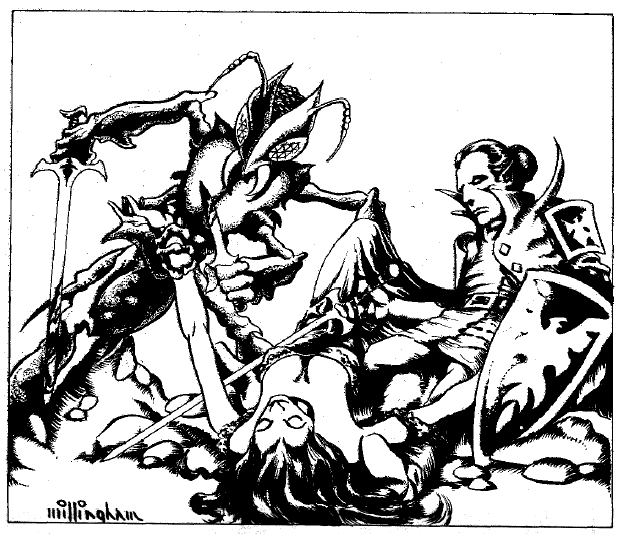 It's a style of fantasy I always digged, and one which I wish had had more coverage in Dragon. Check the end of the article for another glimpse of Swenston's work. Yes, for those of us who lived through the transition, there was home entertainment BEFORE Dungeon!, and home entertainment AFTER Dungeon!. You young whippersnappers have no idea. In all seriousness, if you've never played the game, I highly recommend it (at least, the old version that I used to have - I don't know if they done any crappy re-imaginings lately). It just occurred to me that it might be cool to combine Dungeon! with Talisman - at least, with the "classes" in Talisman. Boinger off the end of the wooden bench on which they both sat. “Follow him,” he ordered, “and be secretive about it.” It was midnight when the little thief returned. His elven companion had left the tavern common room and gone upstairs to the rented room the two shared, but when Boinger roused him he dressed and came down. The noisy crowd at the bar and fire served their secret purpose better than whispering in their room, where ears might be pressed to the adjoining wall." That image to the right just screams D&D to me, and the story does as well. 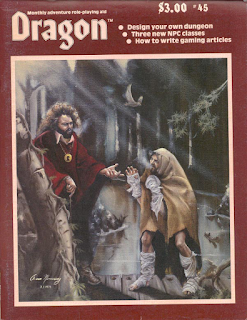 I'll admit I'm not much of a reader of the fiction in The Dragon, which I should probably remedy at some point, given that I dig Gardner Fox, Homes and Gygax. More importantly, It would be interesting to glean some bits of useful lore from the stories that ostensibly come from actual gameplay. This issue goes pretty heavy into variants on Divine Right (which I don't have) and touches on The Tribes of Crane (which I never played). I mention this in case people have do have or have played those games want to check out the issue. 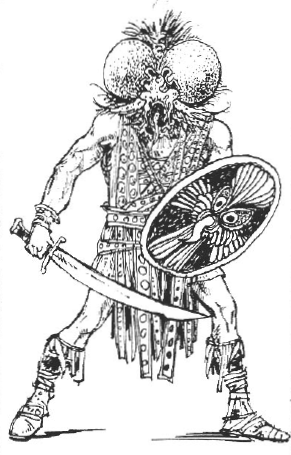 The "Dragon's Bestiary" features the Gaund by Ed Greenwood. Greenwood's monsters are always well thought out, and seem to point to the direction in which games were moving at the time, which I guess you could call fantasy realism. I'm more enthused about Roger E. Moore's "This Here's Tyrannosaurus Tex", a Boot Hill Scenario based on The Valley of the Gwangi. I haven't seen it in a long time - I need to put it on the list. "For every two sticks of dynamite used against a Tyrannosaur in one attack, there is a cumulative 50% chance of stunning it for one turn (10 seconds), a 25% chance of inflicting a wound or wounds (d10: 1-2 = one wound, 3-5 = two wounds, 6-8 = three wounds, 9-0 = four wounds), and a cumulative 10% chance of killing it outright. This percentage is reduced by 20% (for stunning, wounding, and killing) for each 2” (12’) that the monster is distant from the explosion. For example, 20 sticks of dynamite exploded 4” (24’) from a Tyrannosaur has a 460% chance of stunning it (500-40=460), a 210% chance of wounding it (250-40=210) and a 60% chance of killing it (100-40=60). Treat any amount of dynamite greater than 40 sticks as 40 sticks." "Everyone seems to have a place in Boot Hill except the player-characters, who have to be content with a place on Boot Hill. They wander in out of nowhere, invariably causing much havoc and then moving on." I have to admit, that sounds pretty good to me - not sure I want to remedy that situation. However, if you do, you'll find a random table of identities for a Boot Hill character. I dig the fact that female characters have a 2% chance to be nuns. 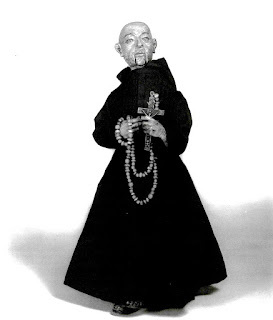 I'd love to play a gunslinging nun. "I wrote The Temple of Poseidon early in the spring of 1980 as part of an application for employment at TSR Hobbies, Inc. Having grown tired of fourteen straight years of school, I decided to take some time off from college and work full-time for a change. The problem was where to find a job. I had already had several, all of which were boring or (as was with the case with piano moving) physically undesirable. A year earlier, TSR had hired my good friend Erol Otus as a staff artist. 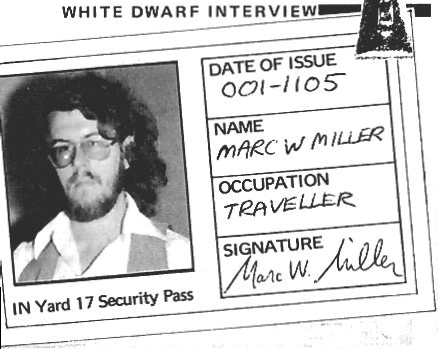 After visiting Erol out in the chilly wastes of Wisconsin, and learning that—contrary to what I had heard—the men and women of TSR were not evil, hateful creatures, I decided that perhaps a job with TSR was the kind of change I was looking for. So with several years of playing experience and authorship of two fantasy roleplaying supplements under my belt (Booty and The Beasts and The Necromican co-authored with Mathias Genser and Erol Otus) I started work on the Temple of Poseidon." He goes on to say the adventure was inspired by Lovecraft and CAS - and it's a great dungeon crawl. Well worth reading and running. 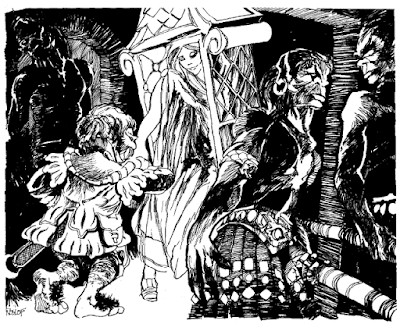 "Time and the way the party spends it plays an integral part in this adventure. 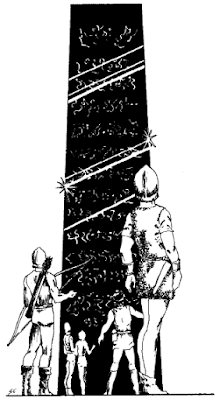 Exactly 10 turns after the characters descend the spiral staircase and enter the alien base, the evil priests of Ythog Nthlei will succeed in freeing their master. The only way to prevent them from attaining their goal is to kill them before the end of 10 turns. 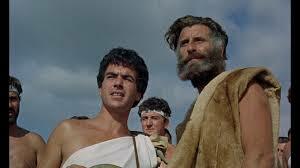 If they succeed, Ythog Nthlei will instantly move to Room 31 with his treasure: The priests will remain in their room." "Giants in the Earth", by Tom Moldvay, opens things up for contributions. So, no giants this time. Dang. 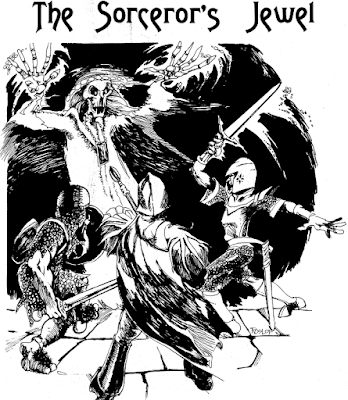 Question: What happens when a cornered (as in a deep pit) undead creature is turned? So basically, it's like the cleric telling the undead to go stand in the corner and think about what they're done. And now we come to the comics, and Steve Swenston's Pinsom. 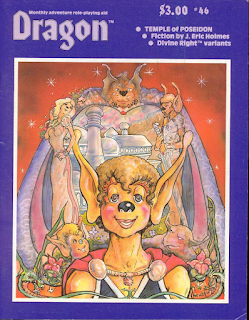 And so ends the chronicle of February 1981's Dragon Magazine. But what were those knuckleheads in the UK up to? 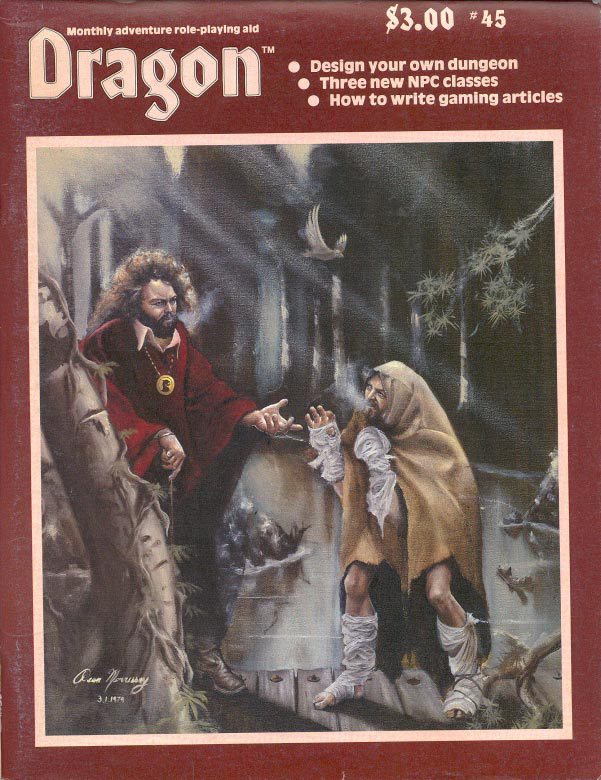 At a minimum, the White Dwarf cover for Feb/Mar 1981 (that would be #23) was putting off a very different vibe than The Dragon. It's definitely an image with which to conjure. 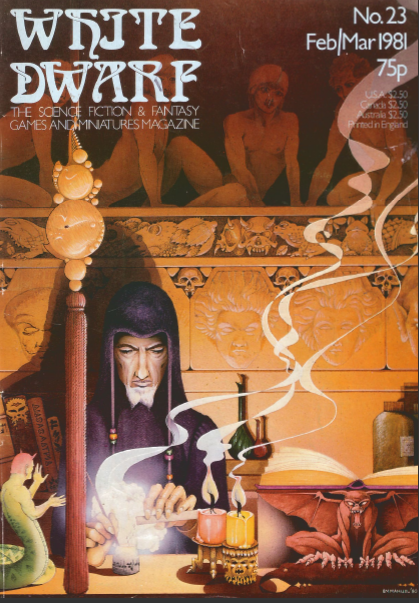 This issue of WD starts a series by Lewis Pulsipher, "An Introduction to Dungeons & Dragons". Good series, and worth the read for the newcomers to the hobby - although I've always thought learning to play these games is much better done by joining an existing group and playing. In the early days of the hobby, though, this wasn't always possible and many groups were learning as they went. 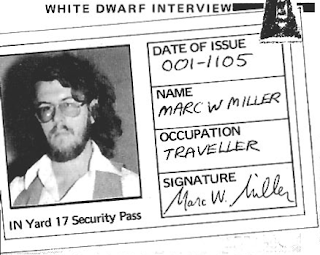 Next up is an interview with Marc Miller, covering his origins and the origins of Traveller. If you're a fan, you might want to give it a look. The "Fiend Factory" this issue has the Flymen by Daniel Collerton, with art by Russ Nicholson - great monsters, though they're only a half-inch tall. However, with a handy shrink ray, they could give a party of adventurers plenty of trouble as they look for a way to return to normal size. Flyman, Tiny Humanoid: HD 0 (1 hp), AC 14 (20 when flying), ATK special, MV 5' (Fly 30'), SV F16 R16 W16, AL Neutral (LN), Special-Swarm surrounds a person's head blinding them (-4 to hit, 1d4 automatic hits per round), tiny weapons are poisoned and people have a 1 in 20 chance of being allergic and suffering ill effect; roll 1d8; 1-7 renders the area stung swollen and useless, taking 1d4 turns to set in and then lasting for 1d20+24 turns. An 8 means the character falls into a coma in 1d4 rounds and dies in 1d20+24 turns unless the venom is neutralized. Drone, "Medium" Humanoid: HD 0 (3 hp), AC 12, ATK nil, MV 20' (Fly 50'), SV F13 R16 W17, AL Neutral (LN), Special-Strength of 17, semi-intelligent, 1d10+10 appearing. Artisan, "Medium" Humanoid: HD 1, AC 12, ATK 1 weapon, MV 20' (Fly 50'), SV F 13 R15 W15, AL Neutral (LN), Special-Usually armed with unpoisoned daggers, their skill in metalwork surpasses the dwarves. Warrior, "Medium" Humanoid: HD 3, AC 14 (carapace, shield), ATK 1 weapon + poison, MV 20' (Fly 50'), SV F12 R14 W14, AL Neutral (LN), Special-Carry shields, carapace like studded leather, armed with short bow, short sword, dagger, poisoned weapons (save vs. poison, if save suffer 1d6+4 damage, if fail die instantly), allergic people suffer -4 penalty to save, weapons have enough venom for 5 strikes. Flyguard, "Medium" Humanoid: HD 9, AC 16 (chain, shield), ATK 2 weapon + poison, MV 30', SV F9 R10 W11, AL Neutral (LN), Special-Carry composite bow, longsword and dagger (poisoned as above), can size-change and have size rods, ride wasps. Flymage, "Medium" Humanoid: HD 6, AC 16, ATK 1 weapon + poison, MV 30', SV as 12th level magic-users, AL Neutral (LN), Special-Can size-change and have size rods, has innate powers (locate insects, summon insects, insect plague, creeping doom, size change to medium size for 30 rounds) and powers granted by their god, Ssrrpt'ck (must pray for 5 rounds). There are five fly mages per hive, and each has extra powers depending on his role. There is the Master Attack, Master Defense, Master Healer, Master Knowledge, Master Worshiper. The article also includes info on other types of flymen, the Northflies and Sandflies. Awesome stuff - seek it out and use it, for crying out loud. The flymen would make an incredible side trek in a dungeon or wilderness. In fact, the issue includes "The Hive of the Hrrr'l", also by Daniel Collerton, so you're all set. Also: The flymen's heads can be hollowed out and used as masks. Spell causes a creature to shrink by a factor of 144 (human down to 1/2" in height). Spell Focus: A telescoping rod (costs 1,000 gp) that must be pushed in while the spell is being cast. The White Dwarf isn't done yet - you also get a new class, The Elementalist by Stephen Bland, the Khazad-class Seeker Starship for Traveller by Roger E. Moore, and A Spellcaster's Guide to Arcane Power by Bill Milne. That last article involves a spell point system for spellcasting. There are also some keen magic items. All in all, a really good issue of White Dwarf ... in fact, I give it the nod over The Dragon this time around. 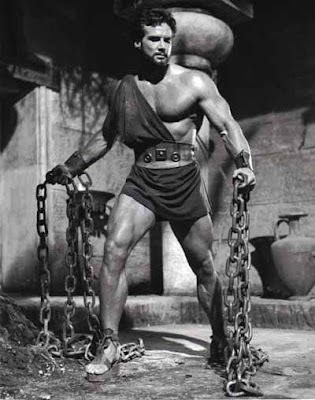 Every day, hundreds of people (or none) email me asking how they can be more like Hercules. They also ask for my social security number, so it may be an elaborate internet scam, but in case it isn’t, I present this guide. If your fighter or barbarian character checks off everything on this list, when they die they will ascend to Mount Olympus and become a god. Any player at the table who plays a cleric will have to convert to your new religion, which obviously means they have to adopt your dead character's alignment and they lose access to spells if they don't fetch drinks and chips for you. If two hit, you score normal punching damage, and are banned from mega-punching again until you gain a new level. We’re all a little disappointed in you. If one hits, you swing wildly and miss. Any ally within fist range, though, must pass a saving throw or get clocked by you, suffering normal damage. If this occurs in a bar, your friend now has to get up and punch a stranger, and so on. If none hit, you lose one level due to embarrassment and divine punishment. This lost level returns after you defeat something awesome in battle – without help Poindexter! Earn double XP, and operate under a bless spell during your next adventure. There is a 1% chance, +1% per person at the table who laughed or snickered at your failure, that the head of the pantheon appears and tells you, and then gives you a quest to fulfill. What's the upside? There is none. 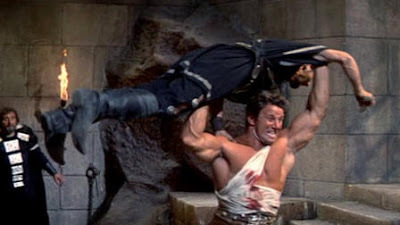 But being Hercules ain't all cheese and crackers, you know. If you're medium, it should be huge. You can warm up on something large, but eventually you need to step it up to huge. And I mean wrestle - not attack with sword. Grab it. Pin it. Choke it out. If the world provides you with two pillars within arms reach of one another, you damn well better knock them down. "But wait," you cry, "I can't do that with even an 18/00 strength!" Then I guess you can't be a god. And not just any chains. The chains with which they bound you. Break out of the chains, then pick them up, and then start cutting down bastards like you're harvesting grain. Heavy chains do 1d6 damage and add 5' to your reach. When attacking anyone who was involved in binding you, you score double damage. No armor, just grim determination and skirts so short they would make a nun blush. Bonus if the army is Inca. You know, because of mythology and such. They may look like earth elementals, but trust me, they're Moon Men and they have it coming. 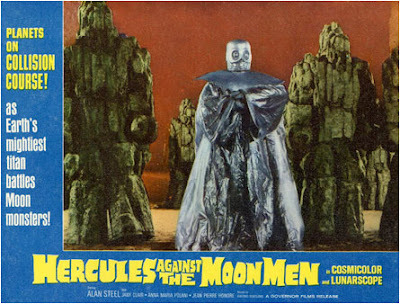 Note - unless you're lucky and they're on Earth plotting to resurrect their queen by draining the life from a human woman, you'll have to go to the Moon to fight them. Proudly, and announce that you're choking a thick snake. Repeatedly. And talk about how your hands are tired afterward. Don't worry - each person at the table that snickers only adds to your glory. It's called confidence, and there's nothing manlier than that. She needs to be scary-hot. And evil. Doing it while under a spell counts. Changing her alignment counts for more. Like, maybe by awakening Talos by stealing treasure you were specifically told not to steal. Of course, you also have to save the day, or die trying. 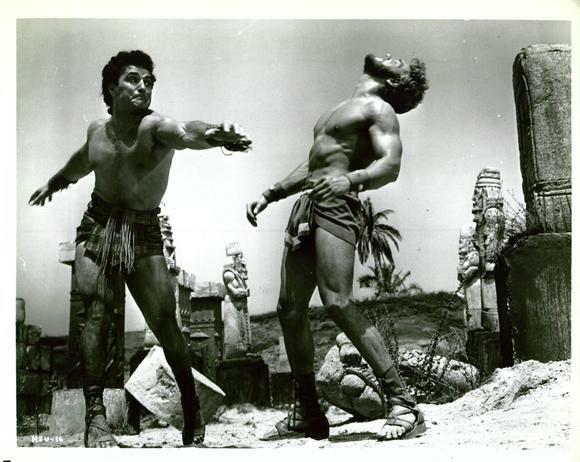 Kill two men-at-arms by throwing one at the other. Extra points for a trick shot. 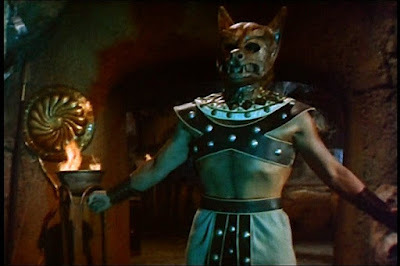 Or a guy dressed up as Moloch. Okay - I just included this one because I thought the guy looked cool. Bonus points if the captain can water ski behind it. Learn to laugh at life! When I get half a second (after Blood & Treasure Second Edition and NOD 29 and Mystery Men! Second Edition), I want to write a quick book called 200 Lines about 100 Men-At-Arms. A nice random selection of folks, with some tables for names, and such. 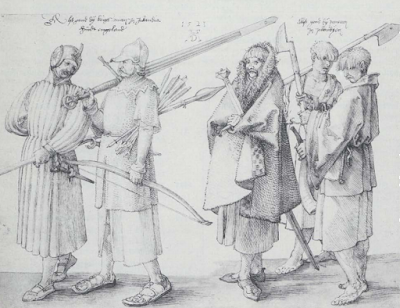 I took the time to peruse a whole crap load of Osprey plates featuring different warriors throughout time, and thought, in the meantime, I'd share how those men-at-arms were equipped. So here's over 400 men-at-arms and their equipment, arranged by time period (-35c means 35th century BC, 5c means 5th century AD, and I'm sure you can figure it out from there). Use them as henchmen or randomly encountered warriors or random starting gear for fighters or whatever else you can think of. If you have a d408 you're golden. 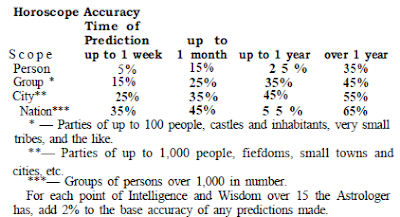 You could also roll 1d5, then either 1d100 or 1d8 to generate a random man-at-arm. Inflation was rough as hell, but if you scrape it together you could get a new Tandy TRS 80 PC for $150 (or $390 in today's dollars). This year would see the release of the hostages in Iran, the first flight of the space shuttle Columbia and an attempted assassination of President Reagan. For the geek set, it was an embarrassment of riches in the movie theaters - Raiders of the Lost Ark, Mad Max 2, Evil Dead, An American Werewolf in London, The Howling, Halloween, Escape from New York, Clash of the Titans, Time Bandits, Scanners, Excalibur, Dragonslayer and, of course, the finest film ever made, Cannonball Run. "Using the rule-of-thumb design specs of 500 cubic feet per person of room volume and 24 cubic feet per minute per person of ventilating air, and applying a little algebra, we find that the ratio of incoming air volume to room volume is about 1:20.83." 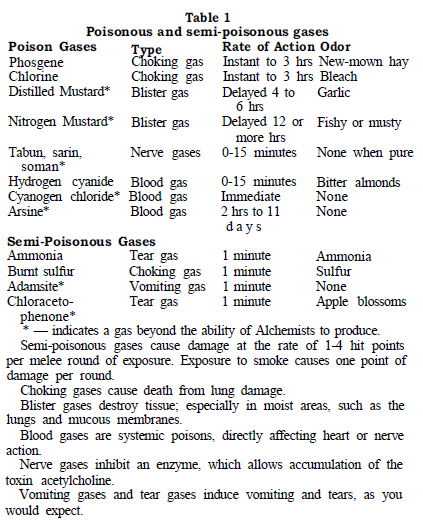 A successful save vs. poison gas means holding one's breath and escaping the gas. A failed save means breathing the gas and dying. Initially one falls unconscious and dies 5 rounds later. 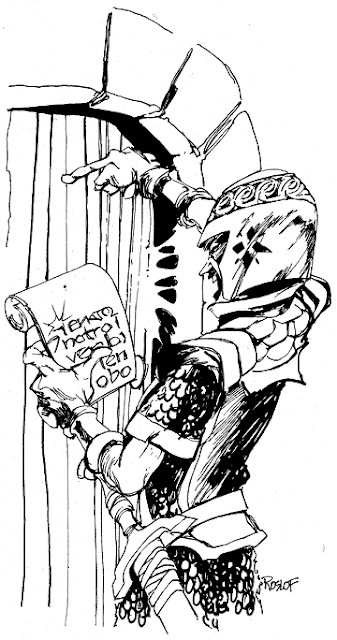 Next up, we have a couple old school NPC classes - the Astrologer by Roger E. Moore and the Alchemist by Roger E. Moore and Georgia Moore. These are nice and short classes, and could probably be adapted as non-classed NPCs with interesting abilities by most GM's. Of course, I'd also love to see them used as PC's in a game. "For the creation of homonculi, it is suggested that Pseudo-Dragon venom and Gargoyle blood be among, the. required ingredients, as well as the Magic-User’s own blood, since these items bear some relationship to a Homonculous’s poisonous bite and appearance. Costs and time for making a Homonculous are outlined in the Monster Manual." "Formulas for manufacturing cockatrices may be found in L. Sprague de Camp’s book, The Ancient Engineers, Chapter 9, “The European Engineers.” Additional notes appear in The Worm Ouroborous, by E. R. Eddison, “Conjuring in the Iron Tower.” Note that de Camp’s book refers to the cockatrice as a “basilisk,” and tells of an alchemical way of making gold from burnt “basilisk” parts." One more reason to read Eddison's book, and now I want to find de Camp's as well. "At the Dungeon Master’s option, cloning may be performed by biogenesis-studying Alchemists; this should be considered a very powerful (and very rarely performed) ability that will entail expenditures of 100,000 g.p. or more." Philip Meyers' article "Magic Items for Everyman" covers random magic items for NPC's. They're quite extensive and worth taking a look at. Bazaar of the Bizarre has a couple nifty magic items. The Eidolon of Khalk'Ru is a real pip if you have a cleric or magic-user in the party (and who doesn't?). There's also the Bell of Pavlov, box of many holdings, ruby slippers, ring of oak and pet rocks - man I want to pit a guy with three pet rocks up against an unsuspecting party. But hey - we're not done with new classes yet. Len Lakofka presents a new fighter or ranger sub-class, the Archer. Really, it's the archer, a fighter sub-class, and the archer-ranger, a ranger sub-class. This is accompanied by whole host of advanced rules for missile fire in D&D. 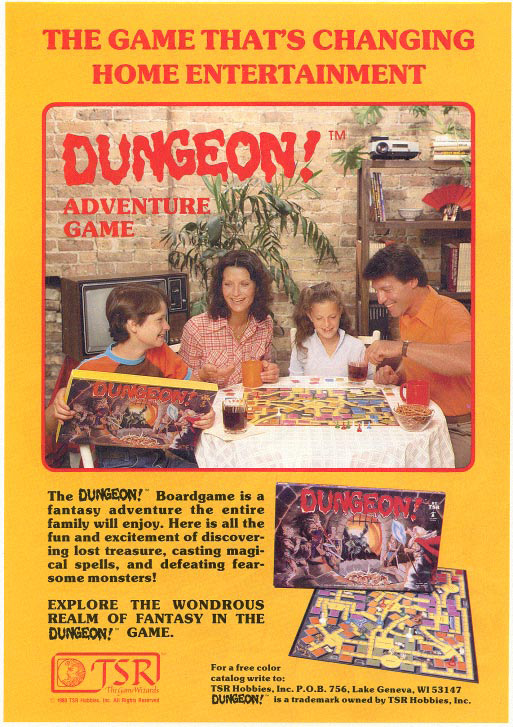 The big feature of this issue was the Dragon Dungeon Design Kit - a bunch of cardboard pieces you could use to create tabletop maps of the dungeon rooms adventurers encountered. You got wall sections, treasure chests and all sorts of dungeon dressing. Michael Kluever's article "Castles, Castles Everywhere" is a nicely researched article about castles. Worth the read. "Now for the group goals. Anyone who’s played Monsters! Monsters! already knows what the goal is in an evil campaign. The goal is to beat up on the good guys. The goody-good Paladins, sneaky Rangers, and less-than-macho elves are going to get what they deserve. What right have they got, breaking into our lairs, killing our underlings and friends, and taking away the treasures we worked so hard to steal? Besides, what we’re doing is the way of the universe. Only the strong survive. Nice guys finish last. I’m number one. If you help all the wimps get ahead in the universe, you undo natural selections and evolution, which is trying to make us tougher. Might makes right. And so on. Working up the goals and general background philosophy of an evil campaign is not difficult (and is actually a little disturbing, as some people say such things in seriousness. How little we know about our own alignments ...)"
Art by Willingham, of course. 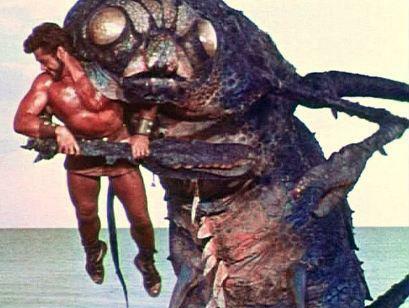 It's actually not a bad beastie - nomadic insect people. Skyzorr'n, Medium Monstrous Humanoid: HD 2+1, AC 16, MV 20', ATK 1d4 claws (1d4) or 1d2 by weapon; AL Chaotic (LE), Special--Bite for 1d4+1 plus poison, surprise 1-3 on 1d6, immune to natural paralysis (not spells) and 90% of poisons, +2 to save vs. heat and cold attacks, resistance to edged and piercing weapons. Read the issue to get the full description - very cool. They also have sand lizards by Marcella Peyre-Ferry and dust devils by Bruce Sears. Well - that's all folks. No White Dwarf supplement this time, since it was bi-monthly. I'll hit it next week (God willing and the creek don't rise). Just a lazy Saturday post today with a few preview locations from the next Og hex crawl in NOD 29. Pour yourself a drink and enjoy! Morgor is a mining village of 400 lanky hill dwarves and flinty gnomes. 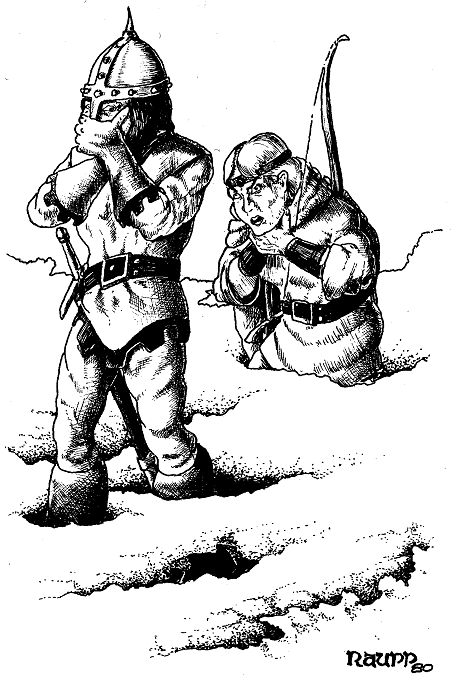 The dwarves of Morgor are more lively than most due to the positive influence of the gnomes and their hand organs. 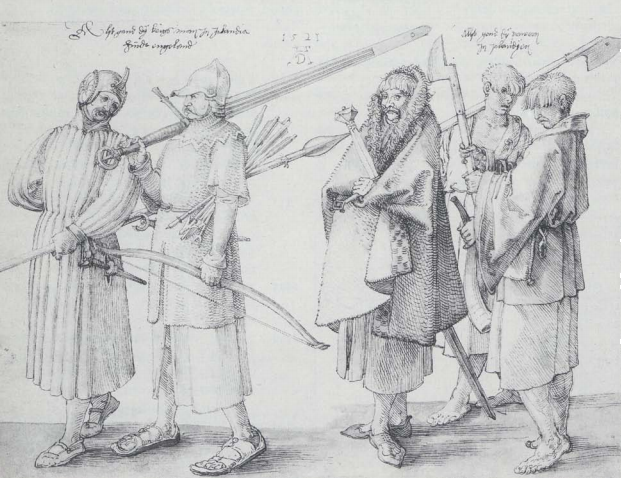 The warriors of the village, 20 dwarves and gnomes, wear bulbous helms and coats of mail and carry military picks and light crossbows. The village currently looks abandoned, for the people have had to withdraw into their mine. They have been terrorized for more than a week by a weird sorcerer called Tall Darrow. The countryside around the main village is populated by 3,200 dwarf and gnome farmers. Many of them have fled the area and are on their way as refugees to Azsor. Many others are hiding in cellars or caves in the wilderness. Tall Darrow has pale, waxy skin spread over his tall, thin form. He is capable of replacing his head with one of six others, all of them being the preserved heads of ancient sorcerers, and each having their own set of magic spells that they know. Each morning, the sorcerer can remove one head and then attach a new one – this can only be done in the first rays of dawn, and the process takes 10 minutes during which the sorcerer can do nothing. Morgor’s ruler is the Lady Ymarr, a rough and tumble hill dwarf war-maiden with a pet winter wolf she rescued as a cub. The wolf is growing impatient in the mine, and is threat-ening to return to its naturally evil form. 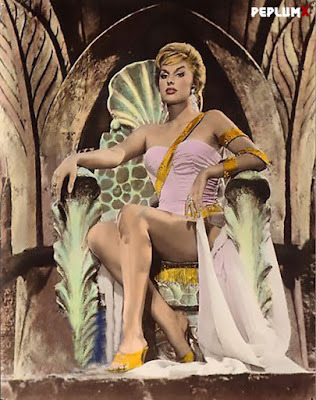 At the moment, a storm giantess by the name of Avnell is consulting the subterranean oracle about whether her lover will ever return from Utt, the City of Giants located far to the north in the White Mountains. She is quite distraught, which explains the gloomy clouds and temperamental rains that plague this hex at the moment. If adventurers will promise to journey north and find her lover, the erudite storm giant Jondr, she will promise them the moon and the stars. A herd of shadow horses sweeps down from the hills at eventide, leaving crystal growths to grow behind them. These crystals last for 1d4 hours before they explode into a mist of negative energy that chokes and drains. The mist persists for 1d6 hours (or 1d6 turns if there is a strong wind, 10% chance). The crystals can be harvested and used to create magic items, but they drain 1 hit point (permanent) per day from any within 10 feet of them. The horses are heading towards the City of Sand and Stone . The Temple of Mental Fortitude is a strange place indeed. The “temple” consists of a thousand stone pillars of unknown height, emerging from a valley shrouded in chill mists. In the surrounding mountains dwell a flock of giant eagles. Seekers of enlightenment come to the lip of the valley and meditate for three days before holding up a golden offering to the giant eagles. If they are judged worthy, an eagle swoops down, grabs the monk with its talons (inflicting damage) and deposits them atop one of the icy pillars. The pillars are about 10’ in diameter. There, the monk con-tinues his meditations for 14 days, eating nothing and hydrating himself on the ice that gathers on his pillar. This mortification of the flesh is intended to bring about enlightenment and mental fortitude. If they survive, they increase their Wisdom by 1d4, and reduce their Constitution by the same. When a monk has finished his time on the pillar, he crawls to the edge of the pillar and leaps off. A giant eagle will either catch him and carry him back to the edge of the cliffs that ring the valley, or he plunges into the mists and is never seen or heard from again. A crevice in this hex, narrow and spooky, hides a small temple dedicated to Ruch, the Fox Spirit of the Qum’al. The temple is carved into the red walls of the crevice, with a single small door flanked by bas-reliefs of fox women. The door opens to a tunnel entrance that goes back about 30’ into the cliffs, ending in a chamber 20’ in diameter with a 30’ domed ceiling. The temple room is completely dark – magically dark – with a number of motes of light that resemble stars. These motes orbit the dome, moving slowly unless somebody attempts to grab one or interfere with one – then they scramble and swarm around the room at full speed. Grabbing a mote (treat them as AC 25) causes a terrible burn (1d6 damage) and leaves a key-shaped imprint on their palms. If the key is made and one returns to the temple they will find it guarded by seven foxweres, lithe women wrapped in poly-chromatic veils that hide mithral mail shirts. They are armed two scimitars and can cast spells as 4th level druids. In the floor of the temple there is a tiny hole, just big enough for a key. When a key created from an impression left by a mote is put in the hole and it is turned, the corresponding mote becomes larger as the key is turned, and becomes a portal into a vault buried deep beneath the ground. These vaults belong to some of the greatest thieves in the world, and are guarded by death traps of their own devising. Here, they hid away their greatest treasure – their memories and true identities. Have a groovy weekend. I'll be back tomorrow with a Dragon review (I hope).